When I right click on the nib files I want to edit I don't see the "Show Package Contents" option. Any idea why? What .nib are you trying to edit? The .nib should likely have an Interface Builder Document icon. If you are trying to do this on keyedobjects.nib, you don't need to. Simply drop the files into the same folder as that file, step back one level, and open the file. Still suffering same's Adam's problem... any idea? 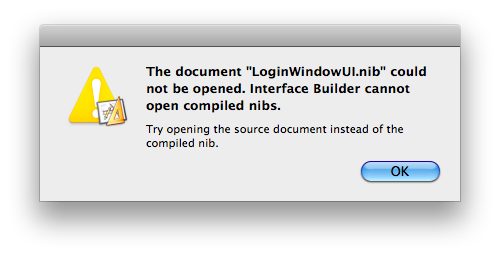 What .nib (path, if possible, and application if applicable)? Can you navigate into the .nib using Terminal? What OS? Does this option never show up or just with this file? thank you very much for this information. I was finally able to open the .nib file. However, another obstacle. I can not save any changes to the file. It says I don't have permission. I changed all permissions in all files (by clicking "get info" and then setting myself as the owner in bottom of get info window). Do you know if this is a common problem? Hey! I don't know how but now it saves! Anyway, this thread was the only answer I could find on how to open the .nib file. I've never seen said problem. I'd be careful with changing permissions too much...and always work on a backup just in case. I use a copy of that file and it does not have a "Show Package Contents" option. Other .nib files do, at least the editable compiled ones. Yes I can navigate to it in Terminal. How can Terminal help me? How did Dominick solve this problem? Then you get a working .nib file that is uncompiled and ~does~ have "Show Package Contents" available. It must also have "classes.nib", "info.nib", and "keyedobjects.nib" within the package contents of this uncompiled .nib file. Take the compiled .nib that you cannot open the package contents with. Then rename it to "keyedobjects.nib"
Drop the new "keyedobjects.nib" into a working copy that contains the 3 .nib files named above. Then open that .nib file with Xcode 4.1 or greater, or interface builder. If it fails in interface builder, open with Xcode so it can be repaired. Thanks for the feedback and solution!